It has been quite a week! I had a quick trip to New York where I was able to meet some editors, taped a bunch of videos for NBCNewsBetter, and did a cooking segment out on the Plaza for The Today Show. Yesterday, I returned to my favorite local LA show, KTLA morning news to cook from the book, did a fun Facebook Live with my friend Catherine McCord from Weelicious, and spent the evening at Pages Bookstore in Manhattan Beach for a fabulous party celebrating my new book. Pages, by the way, is the only source for signed copies of my book! Right now I am taping a cooking segment at Hallmark’s Home & Family which will air on Monday. So exciting! I have enjoyed hearing from so many of you that you are already having success cooking from the book. It has been surreal to see the recipes from the book come to life on Instagram and Facebook! Thank you for sharing the photos and your enthusiasm. Today I want to show you a recipe which I taught in my classes last spring and one that you are going to FLIP over. 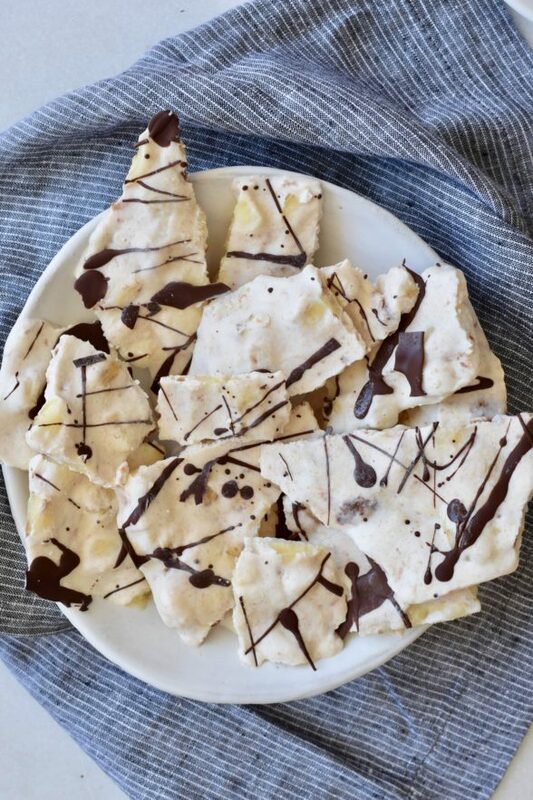 This frozen yogurt bark is a healthy snack for summer, infinitely customizable and super simple to make. 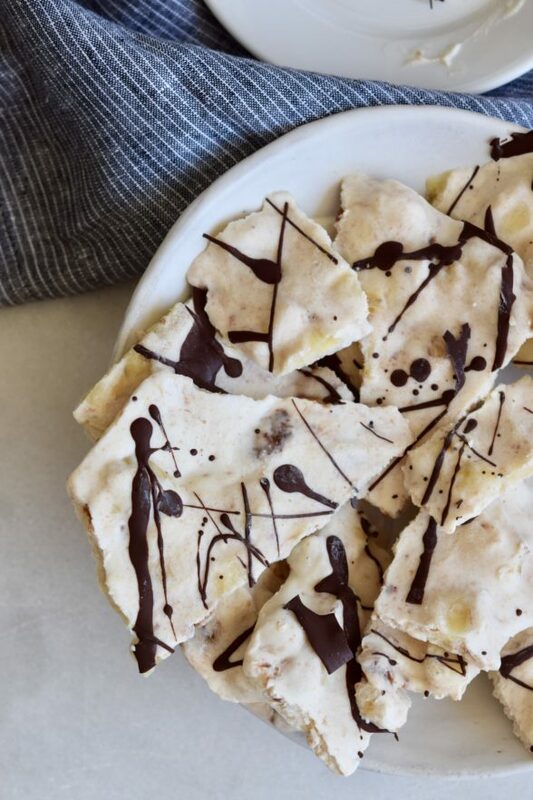 When I think of “bark,” chocolate bark comes to mind. I picture melted chocolate studded with nuts and dried fruit which is then cooled to a hard state and broken into irregular pieces. I thought it would be a fun idea to do this with Greek yogurt which I would then flavor in different ways. After the yogurt is flavored, it is spread onto a parchment-lined baking sheet and frozen until solid. Then you break it by hand into irregular pieces and eaten out of hand. It is so addictive and delicious, but totally healthy! My husband loves ice cream after dinner, but ice cream doesn’t love him (any time of day.) 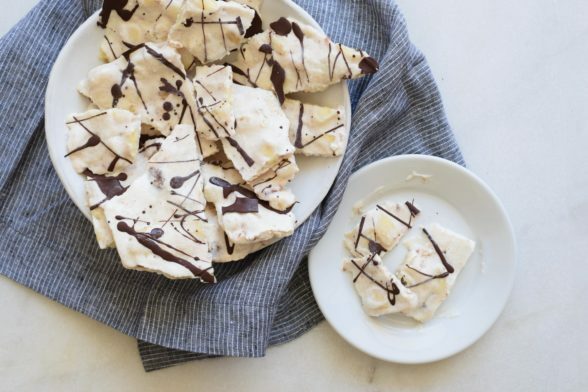 A big stash of this bark in the freezer is his go to snack when a sugar craving hits. And, I let my kids eat it for breakfast, as well as after school, because it’s just yogurt and fruit with a little maple syrup. When I taught this in my classes last year, I only had time to do one variation, which is this one with bananas and all-fruit strawberry preserves. But I offered other suggestions such swirling in peanut butter, or sprinkle in granola, or if you hate bananas you can stir in soft fruit like fresh figs. I tried adding chopped strawberries once and they were too hard once they were frozen. Same with dried fruit — I almost broke my teeth on a frozen dried cranberry! 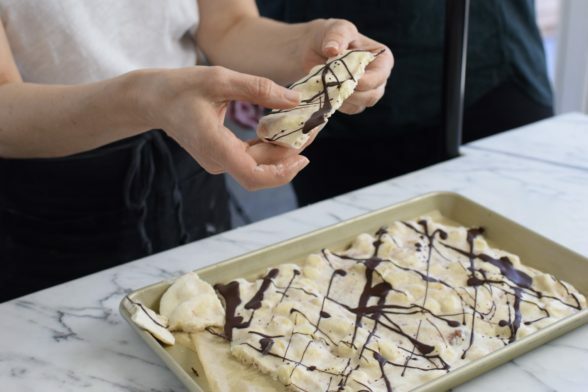 This the kind of treat I love — easy to make, higher quality than store-bought popsicles or ice cream from a carton, not expensive, and customizable. I think you’ll have a lot of fun with this recipe this summer! Once again, I have no idea why my Easy Recipe plugin is not working! I am so sorry. Copy and paste into a word document to print! Combine yogurt, syrup, vanilla, and salt in a medium mixing bowl and stir until well combined. Stir in strawberry reserves and diced banana. 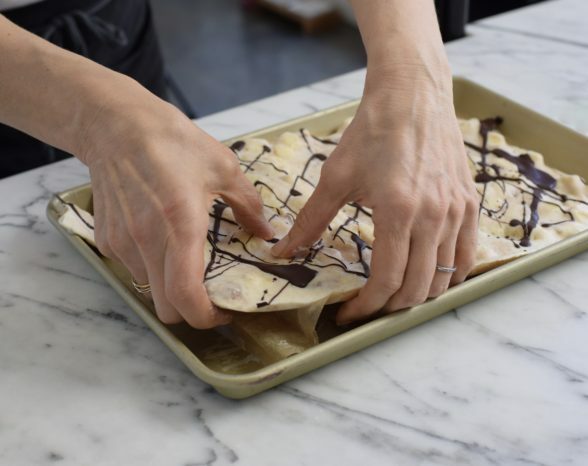 Pour mixture onto prepared baking sheet and spread it into a ½”-thick rectangle or oval. Freeze until firm, about 2 hours. Optional (you can do this before you freeze the yogurt or after is is frozen): melt the chocolate and coconut oil in a heat-proof bowl set over a pot of simmering water. Drizzle the melted chocolate over the yogurt with a spoon. After the chocolate has hardened (this should happen immediately), break into pieces and store in a covered container in the freezer. The bark should stay good in the freezer for up to 2 weeks. this looks delish! what size baking sheet do you recommend? I made this and my daughter thought it was the best thing she has ever eaten. I’m not sure the rest of us got much of it. I didn’t even get to put the chocolate on it because she said it didn’t need it. It was that good. 🙂 It is a great snack and breakfast. I think she ate it as both. She has been at camp all week and comes home today so I think I will pop some in the freezer for her to enjoy when she gets home. Thank you as always. So great to hear! It has become my family’s favorite treat and I’m thrilled everyone is enjoying it as much as ice cream. Yay! What a fantastic recipe . . . a wonderful combination of ingredients and so easy to make! My 4th of July breakfast consisted of the frozen yogurt bark and an assortment of blueberries, strawberries and raspberries. Not only was it refreshing, but it started the day with a red, white and blue theme! Thank you very much, and Happy 4th of July to all! Terrific, Mia! I don’t know why I didn’t do a red, white and blue bark. Next year! sooo good!! my 11 year old has made it twice in 12 hours. thank you! This looks delicious! I never would have thought to do this with yogurt!